I wish you could see the giant smile on this farm girls face today. Because today I get to tell you all about PARTNERS ACROSS THE POND On-Line Video Classes. If you love to build your craft room supplies, receive a bunch of extra items and are a visual learner, then you're going to love my new adventure. I have partnered with two extremely talented ladies to bring to you, WEEKLY On-Line Video Classes. We will be rotating as instructors weekly, therefore, you will have the opportunity to create cards and 3D items designed by ALL of us. If you live in the United States you will purchase your Classes through ME by CLICKING HERE, if you live in Australia you will be purchasing your Classes through Donna Gray by CLICKING HERE, and if you live in the United Kingdom you will be purchasing your Classes through Natalie O'Shea by CLICKING HERE. Our new Adventure kicks off on WEDNESDAY, January 3, 2018 with our very first On-Line Video Class. Each class will be available for purchase for a 2 week period. But, EVERY Wednesday an entirely NEW On-Line Class will be available for purchase. So turn your reminders on for Wednesdays so you don't miss out on the new class each week. If you love learning from ladies with different styles and did I mention DIFFERENT ACCENTS, you're gonna love PARTNERS ACROSS THE POND!!! Can it get any better? Why YES it can!!! 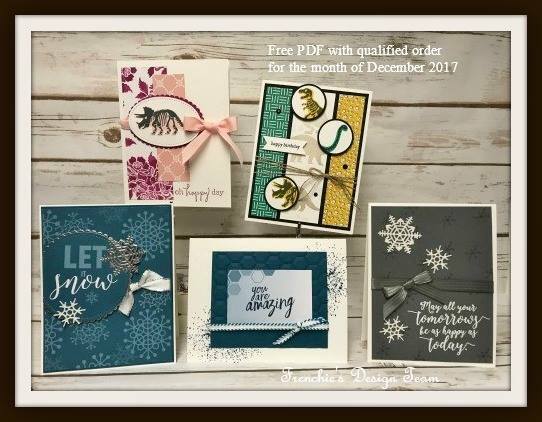 ALL On-Line Classes from January through March will qualify for a FREE item from the SALE-A-BRATION Catalog, CLICK HERE for a sneak peek of some of the beautiful items you will have to choose from. You can find out all the details by CLICKING HERE, and if you have any questions please feel free to holler at me anytime by phone at (405)527-5795 or email at michelewright62@windstream.net and I'll get right back to you. Make sure and spread the word to your fellow crafters' as they won't want to miss this awesome adventure either.